Something is changing in engineering and I think it might be really big. For the last few days I’ve been in San Francisco at the REAL2015 conference. It’s an unprecedented gathering of engineers, architects, makers, builders and wild visionaries. Over the last 48 hours I’ve seen drones that scan and build 3D models of enormous civil projects, massive point clouds that have changed the way architects redesign structures and scanning technology that can render a high-fidelity CAD model from any real world part. While its true that LIDAR, scanning, 3D printing and a number of other similar techs have been available for decades, they’ve always been too expensive to scale. What’s more, applications built to make sense of rich and massive point clouds haven’t had the computing resources to manage that data. That’s all changed and engineers, architects and designers are already taking advantage of this new reality. The term reality computing refers to capturing real-world data through 3D scanning and sensor technology and then processing it into a useable 3D digital model. Reality Capture is helping people build new products, but the other side of the coin is that Reality Capture has tremendous potential when it comes to metrology and inspection. 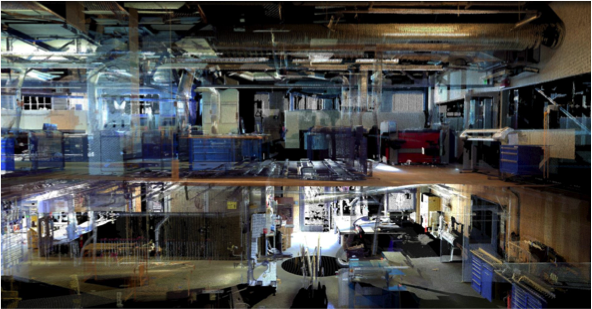 With the accuracy of multi-billion point clouds, buildings and even entire civil engineering projects can be measured and assayed for their accuracy in a myriad of ways. In fact, if you’re working on an office redesign, a complete building overhaul or even on a project where the plans don’t match up with the facts on the ground, Reality Computing can turn your headache into an asset. Beyond Reality Computing’s ability to digitize the extremely large, it’s also a powerful tool for fine detail inspection. Why have we been waiting so long for Reality Computing? So, what’s been driving all of this change? If 3D scanners and good software have been around for a while what’s been stopping engineers from using this tech sooner? The answer’s pretty simple; it all boils down to computing power. Since the advent of the cloud, distributed, massively parallel computing has become a tool available to anyone. With a farm of GPU processors at anyone’s fingertips, crunching humongous piles of data can be done in a matter of hours. That increase in processing speed has made Reality Computing possible. In the coming weeks and month I’ll be writing a lot more about Reality Computing. After seeing the collaborative, experimental and game-changing applications possible with Reality Computing, I’m positive that this finally mature paradigm will change the way we build, design and work as engineers.